2. lspci -nnk | egrep -A3 -i "3D|VGA"
I saw in another thread that Mint should have been able to pick up my card and in the Driver-Manager it should have shown a driver available, but it didn't so I had to go searching for one. 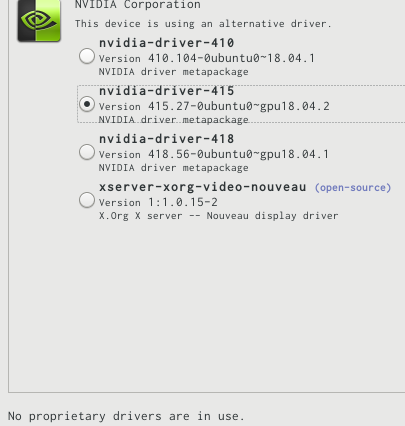 It currently does show in there, but it says "This device is using an alternative driver" and "No proprietary driver in use", so I am not sure if that is what it is supposed to be with this card? If anyone has any info or suggestions, I would appreciate it! The Driver Manager version that comes with Mint 19 is buggy and often reports the wrong info, such as: No proprietary drivers are in use. You can also test the Force Composition Pipeline option. I definitely appreciate the reply. That seems like it may have done the trick for the tearing. The text throughout the system is still a bit fuzzyish in places, but that is not of super concern and I am sure if I mess around with enough things I will be able to find something to help with it. I have been using server distros for nearly 2 decades but have not really messed with a desktop distro since SuSE was S.u.S.E slackware, so trying to figure out what is what and where is where is going to take a few minutes, lol. In System Settings > Fonts, change the setting for Hinting to Full. Under > General, set Disable compositing for full-screen windows to OFF. Under > Effects, set Window effects to OFF. You can download Mint MATE, install it to a USB, and run a Live Session. Under Appearance > Fonts, there is a Subpixel smoothing option. Under Desktop Settings > Windows > Window Manager, you can test different Window Managers. As a last resort, read the following, but be sure to create a Timeshift restore point before making any changes. See the comment by gautam0217 on May 11, 2018, about the libfreetype6-2.8.1 package. FreeType 2 is the software font engine used in Ubuntu 18.04/Mint 19. Mint 18 used version 2.6.1. Then open Update Manager, click Refresh and the new package should be at the bottom. You can always revert back to the previous version using Synaptic. Thank you much for this info, I will be sure to give them a try!